Maarten Ten Holter at Vripack Brokers asks me to announce that they have become the exclusive agents for the entire range of Admiral-Tecnomar yachts for The Netherlands, Germany, Denmark, Norway, Sweden and Finland. Admiral-Tecnomar has built 413 yachts since 1966. The range consists of yachts from 30 to 75 metres whereby there is great flexibility in design, specifications and outfitting. With in-house designers and naval architects, the yard is capable of satisfying every client's needs. Also, being part of The Italian Sea Group, the yard benefits from great financial strength, which could be considered a major advantage in these turbulent time. 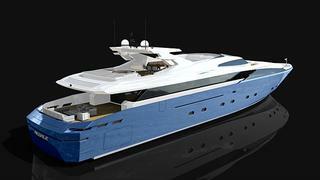 Admiral Tecnomar was most recently in the news after signing a contract to build a new Regale 45 planing motor yacht.